In a joint press conference Tuesday, N.C House Speaker Thom Tillis and Senate President Pro-Tem Phil Berger gave a broad outline of their recently-reached compromise on the state’s $21.3 billion budget for the fiscal year that began July 1. The Republican legislative leaders used the half-hour press conference to outline what the budget would do (teacher and state employee raises, avoid kicking some elderly and blind off of Medicaid) but didn’t delve deep into details abgoutwhat cuts could be seen in other arenas. WRAL’s Mark Binker has a good run-down on what’s known about the budget proposal here. 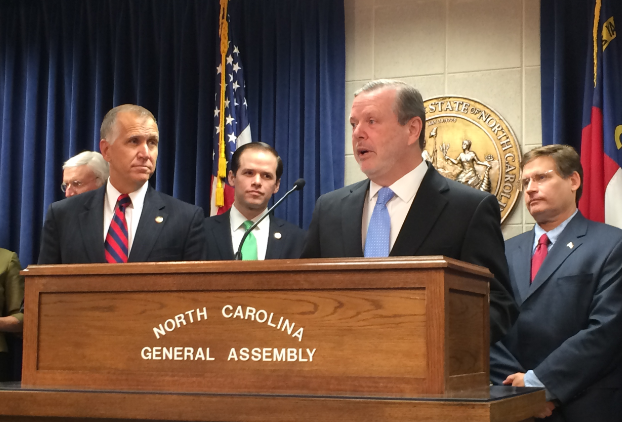 Click here to read Tillis and Berger’s press release. The state’s teachers would get average raises of 7 percent, working out to approximately $3,500 per teacher, at a cost of $282 million. The teacher salary schedule would also be compressed from 37 steps to six steps, said Berger, the Senate leader. North Carolina teachers are among the lowest-paid in the nation, and the state is ranked as the 46th lowest-paid in the country. Tillis and Berger say their plan would boost pay to 32nd in the nation. Less is known at this point about what revenue streams would be tapped to pay for the raises, and lawmakers avoided going into great detail about what cuts to other state functions would be coming. Those details won’t be available until late tonight or tomorrow morning, when the full text of the compromise budget will be released at ncleg.net. State Rep. Nelson Dollar, the Republican House budget writer, only touched briefly on the cuts, saying that while Medicaid eligibility would be kept the same, providers would see a one-percent reduction in what they are paid in order to account for $135 million in cuts. Kudos to the Republican legislature for the first significant pay increase to our teachers in many years! Wait for the details,Social Darwinists no doubt, will be cheering. This article says that teachers will be getting a 7% pay raise. It is not true. The proposed average 7% increase is not a 7% raise as it includes folding in longevity, a benefit that educators already receive. State employees will receive a $1,000 raise while education support professionals and central office staff will receive $500; in the past all received the same raise. The new budget diverts more public tax dollars to vouchers with few accountability measures in place. It also shifts the burden to districts to decide how to fund changes or cut positions under the idea of flexibility. There is no plan to bring NC teacher’s wages to the national average. Please update this article.